Chicken Blog: Celebrating 1,000 Deep Thoughts and Other Musings: It's Chickenblog's Favorite Things Giveaway! Celebrating 1,000 Deep Thoughts and Other Musings: It's Chickenblog's Favorite Things Giveaway! Well, here it is, the 1,000th post. The 1,000th time I turned my back on alphabetizing our CD's, or cleaning the oven. The 1,000th time I felt sure my whirls of pisdom pearls of wisdom were worth publishing on the world wide web. 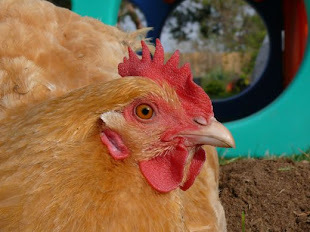 Gone are the the actual chickens that inspired the name of the blog. True, some posts were absolutely pointless... btw if you have a dial-up modem don't bother with this link. Other times I managed to capture a day or a moment and hold it a bit longer, appreciate the bliss of it, and then share it. Sharing stuff has been a major impetus for starting and maintaining Chickenblog. By the way, I had to look-up impetus, which brings me to another point: Chickenblog has been a learning experience, a challenge, a means to learning new skills... whoa, has the blog come a long way! I still depend on Geoff for my technical support, but at least now I have learned how to post pictures, and make links, so that the sharing part is, hopefully, more interesting, engaging, and compelling, and fun, and good, and stuff. Uh, sorry about that. I know, sometimes I say too much... blah, blah, blah, blah, blah. But, saying something is the whole point of blogging and it's been cathartic expressing my points of view. Are you still there? OKay. Good. This brings me to feedback. I love comments, and interaction and hearing from people who are browsing, reading and/or immersing themselves in Chickenblog. And it's no secret that I have begged and pleaded, bribed and groveled, all in the name of making a connection. It all goes back to sharing. I miss my family, and friends, and friends that are like family, so I have always seen Chickenblog as a tool for getting connected. Recently I have made many new connections with other bloggers, which has been a lot of fun. I have made friends and discovered that a lot of people like to sew, cook, read, garden, take photographs, give thanks, pout, mumble, blow-off steam, reflect, talk about their children, travel, and share. Thank you for leaving comments, for emailing me. Thank you for your support and points of view. Thank you for your gifts, and swaps, for linking to me, for playing along. Thank you for blogging too... you bust me up and inspire me, and teach me a thing or two. When is she going to give something away? I really wanted to make this contest/giveaway unique, original, special. So, I've been spending way too much time thinking about this and I've come up with something wholly uninspired and pedantic. There will be a drawing on Tuesday, December 11th for a Favorite Things Giveaway. OKay. We all have favorite things, like winning stuff. So, if you like winning stuff, then leave a comment before Tuesday, December 11th and include your favorite Chickenblog post or topic, for a chance to win a few of our favorite things (one entry per person.) In the meantime I will be shopping around and collecting prizes. The most comments ever on Chickenblog is 14, and I think that included 2 or 3 from me... if we break that record I will draw 2 winning names from the "hat". More comments= more favorites! More influence than O. Winfrey! More creative than M. Stewart! She's Doll Quilt Crazy! She's a Shining Princess! She is Calamity Kim of the Craft Cottage, and not for the first time, is she making me blush, with her kind and praiseful commandment... sending readers and record breaking traffic out here to my little Chicken Coop. Thank you Kim. You really, really share the Love. Thank you x 1,000! And Wow! Hello new readers, and long time friends. I hope you are healthy and happy and giddy with holiday anticipation... I gotta go bake some cookies right now, then sew a few more goodies, maybe feed the children. I am glad you came by... thank you! I always go back to Chickenblog because Chickenblog is about FAMILY. I love reading your posts about time you, Geoff, and the kids spent together as a family. I love reading your posts about how your family spends time with other families (your relatives or friends). I love reading about where your family goes and what you all did and ate there. :) I love your family. In the very first Chickenblog post I ever read (sorry I don't remember which one specifically) you were musing about the importance of family traditions. It brought tears to my eyes. I left a comment (and you replied) and I have been addicted to Chickenblog ever since. Hi Natalie, and many hearty congratulations on achieving kilobloggerhood! That sure is a lot of posts. You've become a daily read for me since we got hooked up via Laura in Australia ... and I think Jennifer in Massachusetts had something to do with it as well. Oh! the glory of the blog! Hey Natalie, there's no secret to what I love - you've named two of them: Raindrops on roses and whiskers on kittens... But I think my favorite post of yours was the one where you let Alex design his quilt and how beautiful it turned out. You were passing along a love you have (quilting) to a child who's also inherited your sense of design. How cool is that?! Congratulations on your 1000th! Wow 1,000 posts...now that's commitment! congratulations. I have to say one of my favorite posts was the farewell to Tamsyn. It illustrated what a warm and welcoming woman you are. I feel that warm fuzzy welcome everytime I visit your blog. Congratulations...1000 is a whole mess of posts! Keep it up! What a milestone. Congrats! that seems so far away for me. Love the apple peeler. I have a plastic one, but I've always wanted a vintage metal one. Congrats on the 1000th post! 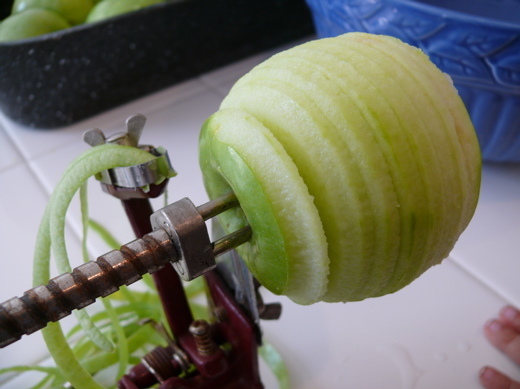 The apple peeler thing looks so cool. It would come in handy when making apple pies. I think that they are all my favorite. Every time I miss a few days and come to catch back up, I sit and read and realize that I am holding my breath and the anticipation grows and then the warm fuzzies start and then the tears blur my eyes and I feel my heart grow and I know you are my long lost sister. My friend. I love you. I love how I feel when I come to visit you. I wish we were neighbors. I am glad that you found me and left a comment. I thank you for all your posts. Big or small. Short or long. dull or deleted. I don't care. I love me some Chicken Blog. You, my blogging friend- ROCK!!! I don't want to be in the drawing though, because you give a gift to me with each post. Thank you. (*<>*) bok bok bok! I'm a new reader of your blog, probably followed a sewing link to you from somewhere, but I come back because you're funny! And you have adorable children. Congrats on 1000 posts. how I hated some of the girls birthdays I didn't want them to grow up I want them to be 3 again! but 3 year olds just love them! Love seeing the world thru their eyes. holy smokes girl!!! 1000??? ok i just celebrated my 100th post. You family is so adoable. your kiddies are so cute! and that maria, forget about it! my fave post is the ois of maria on the chess board. awesome shot. 1000 posts, wow that give me 900 more to go. I am beginning my trip through bloggyland. I love the pics on your blog and your adorable little lady. It is fun to read and check in from time to time. I'm a new visitor via Calamity Kim. Hallo - meeting you for the first time - via Calamity Kim, via Something Sublime - a happy little trail! Happy thousandth, and thank you for talking sweetly about wanting to connect. It's made me want to write this! The dear Calamity Kim sent me here to read your blog and leave a comment. I don't have a favorite yet, but I enjoyed what I've read so far. Do you still have a bunny? I have a bunny named Gary who lives in my kitchen and begs for treats except when he's napping. Congratulations! Nice blog you have here! I found you by way of Calamity Kim and decided to pop in and investigate! Keep up the good work! does it count if I keep coming by to visit and leave a comment? Natalie- do you have Sitemeter? That really helps you see how many people are coming to read you. There are a whole lot more than ever say a peep that's for sure! I love you and your Blog! Rock on sister! Calamity Kim sent me over! I don't have a fav post yet.. but congrats on a thousand! Holy smokes, that's a lot. Congratulations. Ya, know, I've been reading around a bit here this evening and I can tell I should have been here a long time ago. I'm going to pick the Chicas as my favorite category for now. I mean, really, a mom who loves her hens as much as I do and tells people about it?! I call mine, "the Girls" And you sew, and have many boys and 1 girl (I have 4b and 1g. We have much in common. Count me in as a new regular. And, you just might have inspired me to take up blogging myself. I am trying to get your numbers up, I really am! Short of going on walk about and ringing peoples doorbells and forcing them to read Chicken Blog at water gun point!! I mean, really, I have a semi-automatic water blaster that is a super soaker machine! I will use I promise if we don't get to a hundred by Tuesday! Oooo! I LOVE your scarves! Come visit me too! I've only been blogging a short time myself and haven't had more than maybe 4 or 5 comments on one post. Your perseverance is laudable and inspiring. If you happen to draw my name out of the hat just send my prize to Calamity Kim! Wow! 1,000 posts! Congratulations! My blog has four posts, so far. I can't imagine 1,000! I popped on over after reading Calamity Kim's post and immediately added you to my favorites. Great posts, great ideas, great photos. My favorite post that I've read so far, is the December 3rd post with the photos of the leaves. We just raked leaves today and let everyone jump in the pile. Calamity Kim twisted my arm and made me come over. However, I found you c harming enough to add as a read. What more can a interweb blog whore/crafster ask for?? I felt I had discovered a kindred spirit when I first read your blog, and it has been that way ever since. On the surface, you and I are very different (different sides of the country, different sized families, different ages), but the utter delight of blogdom has been finding out how very, very much we do have in common -- and it's the good stuff that matters. I love when you write about your family, about homeschooling and schooling and getting by with doing whatever the best can be for a particular day. I love when you share your feelings and ideas about what your life is about, on the hard things and the joyous things, and I honestly feel that I can HEAR the laughter all along the way. Here's to eleventy-million more posts, at least. I'm here at least every other day. I will try to do a better job leaving comments. I know all to well how it feels. Wow - 1,000 posts - congratulations! And I also know much about not having too many comments! The only two people I have commenting on my posts are my two kids - and they are usually telling me I need to update! But I love to spend my time reading other peoples blogs rather than telling about the old stuff I have been doing - it doesn't seem nearly as interesting! But isn't this blogging community wonderful? No one that I know understands about my love of lurking, and I think there are like three bloggers in Michigan, but one of these days Midwesterners will catch on - although that might be the reason that their homes are clean, and mine looks the way mine does - including still having turkeys and pumpkins up for decorations! And I did finally finish my "Give Thanks" banner/garland last week, so now it will be ready for next week at least! Anyway - more power to you with blogging - have a great Christmas! If I had O's influence- I'd be able to command people to leave at least 100 comments. I'll just keep coming here and leaving them till you get 50. Howz that? I love your calamity gingerbread men. That is totally like something I would do! Wow, I am the 40th comment!! Maybe I will win in your drawing? Congrats on 1000 posts. Did it seem like it took forever?? Hi, Natalie. I got here (for the first time) via Calamity Kim. Don't put me in the drawing or I'll think you think I came just for the prize! I enjoyed your post about your little Maria. We have two 5 year old girls in our extended family; one (another Natalie) is in the 98th percentile for height, and the other is in the 5th--quite the contrast when they get together. You have a lovely blog and I commend you for keeping it up so well. Merry Christmas! What fun! I am here via Calamity's blog. Your cookie baking made me laugh. I'll definitely come back and read more. Congratulations on your 1000th post!